"Oh what a busy, busy time of year. 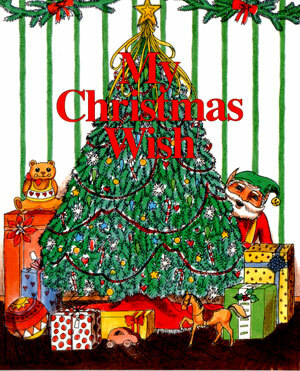 Christmas is coming, and I have so many things to do," said Chinatsu to Koichi , who had come to play. "I have gifts to make and cookies to bake, but that's not all. 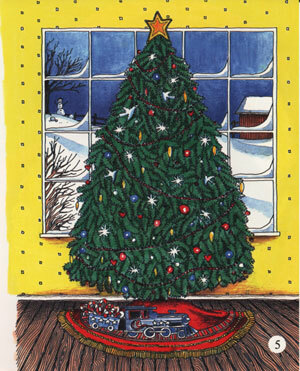 We'll get a tall tree, hang stockings three, four, or maybe more." Later, Chinatsu, Koichi were talking about Santa Claus. 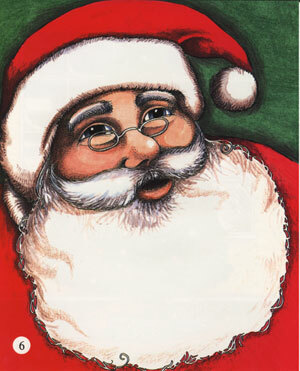 They could picture Santa's jolly, round face with his big smile that was nearly hidden by his long, white, bushy beard. "I have a great idea," said Chinatsu. 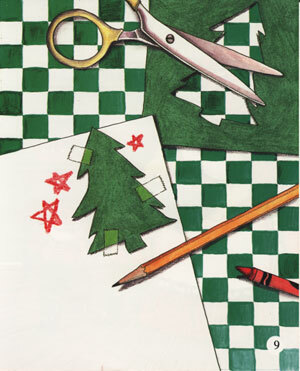 "Let's get our crayons and pencils and each make a list and call it "My Christmas Wish." This list will be special. 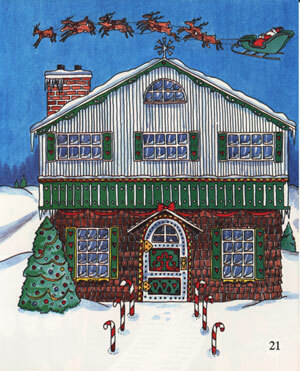 We'll pretend we can go to the North Pole and see how Santa and Mrs. Claus get ready for Christmas." 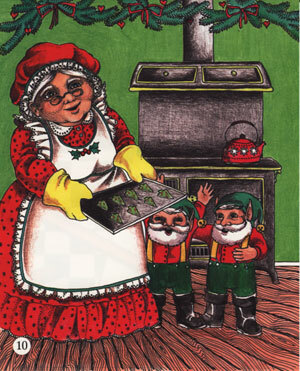 All of the elves work so hard in Santa's toy shop, that Mrs. Claus bakes them lots of cookies for snacks. Some have red icing, some chocolate, and some green. "Ummm, I really like cookies," said Chinatsu, "I wish I could be there to share some with the elves." 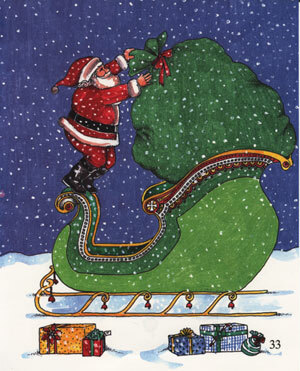 Running here, running there...Santa's elves are very busy. 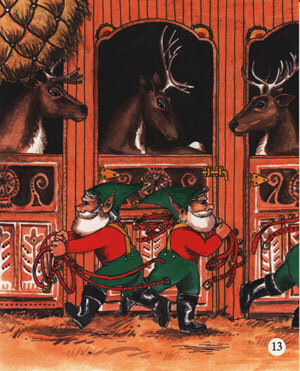 "I wish I could be there to help feed the reindeer and polish all the brass bells," said Koichi. Chinatsu thought of another wish. 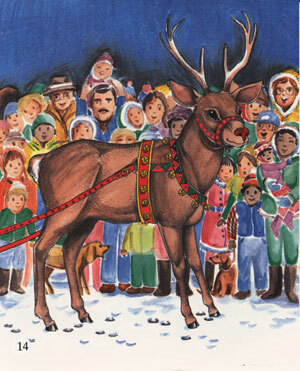 "I wish Santa could bring Rudolph to Osaka. It would make the whole town happy." 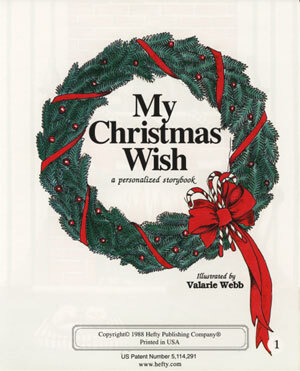 "I just thought of a bigger wish," said Chinatsu. 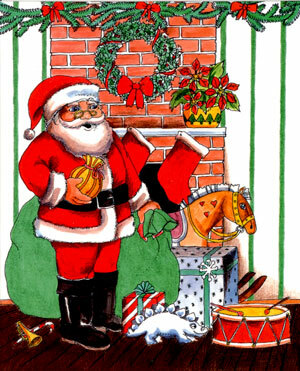 "I wish Santa Claus would come with ALL his reindeer and take me for a ride. Up, up, and away we would fly. 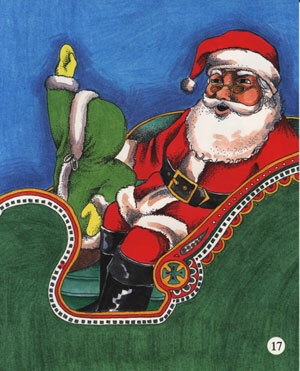 I would wear a green suit to match the color of Santa's green sleigh. As I fly by, I might even shake a bell or two myself." "Well, I have a bigger, bigger, BIGGER wish," cried Koichi. "I can't write it down, it is so BIG. 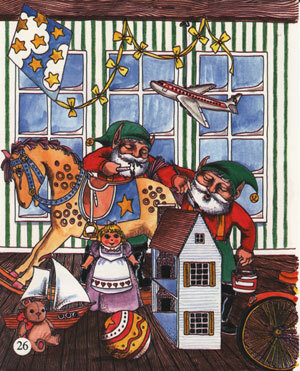 I wish all the children in Osaka, could take turns flying around with Santa Claus. I can just see the BIG smiles." Chinatsu, Koichi were enjoying this pretend game very much. They started wishing they could go to see where Santa and Mrs. Claus lived. They had been told that the walk way to the front door was lined with candy canes! All of a sudden, they found themselves sitting at Santa's table. 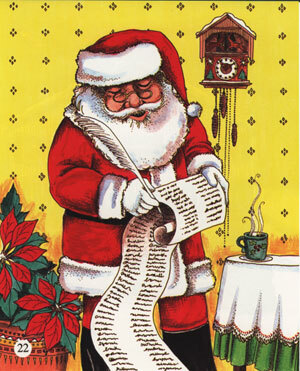 Santa was reading through his very long list of names of children who had been very good. Chinatsu, Koichi hoped their names were on the list. "Welcome to our home Chinatsu. 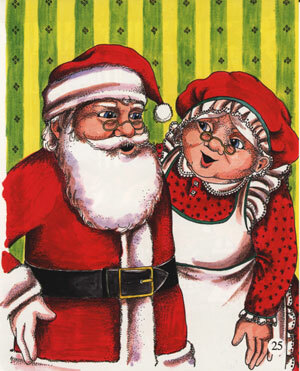 Would you and your friends like some cookies," asked Mrs. Claus. 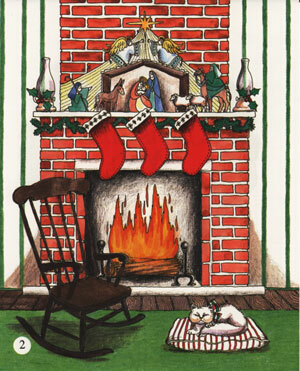 "Santa and I will sing you some Christmas songs. How about Silent Night, or Jingle Bells? 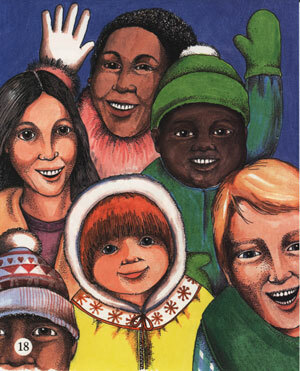 Yes, Jingle Bells," and they began to sing. 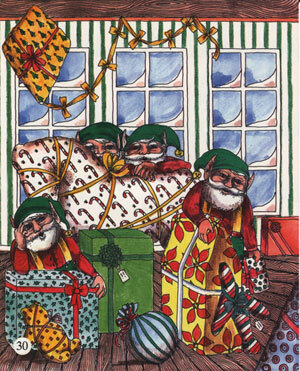 The music could be heard in the workshop where the elves were working very hard. One elf was painting some finishing touches on the roof of a doll house. "I wonder if one of the elves made that little doll ," said Chinatsu, "I would like to have that as a gift for myself." 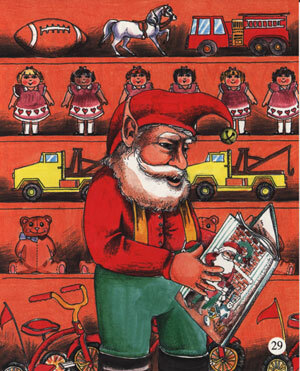 Chinatsu saw an elf pick up a colorful book telling about the real meaning of Christmas. She thought it seemed like a good idea to add the book to her Wish list. "This has been a very exciting adventure to visit Santa and Mrs. Claus and to see how hard all the elves work to get ready for Christmas," said Chinatsu. 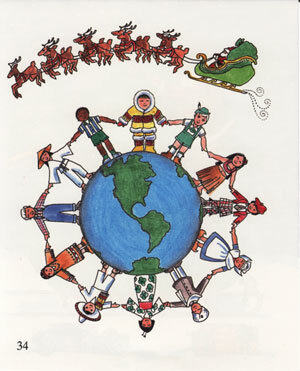 to all the Children of the World."